Everytime I go on Instagram, I see a new product that personalizes your routine. Vitamins, meals, etc. So when I saw the that Prose was now making personalized shampoo and conditioners I knew I had to try it out! First, you take a quiz on the website, which asks you about your daliy routine (ie do you gym a lot, work outside or inside, etc.). It also asks you whether you want volume, dandruff control, damaged/dry hair fixes, and how sensitive you are to hair products. After taking the quiz, it shows you what oils will be used for your product and how you want your product to smell. My shampoo was made for my everyday gym routine. My conditioner protects my hair from the sun (I walk outside a lot), and my hair treatment was made for heat repair to fix my damaged hair. This already sounded more fitting to my own lifestyle compared to other brands I have tried. For $25, I received a customized shampoo, conditioner, and hair treatment mask that arrived in five days. Some ingredients used included argan, sacha, yushi, coconut oils, collagene, lilac, oat lipid, sunflower seed extract, fruit vinegars and acids. I love how transparent the company is with what goes into your product because most hair products have damaging chemicals that are overlooked because of their fancy chemical names. Prose only uses vegan, gluten, and silicone free products. A+ for your body and the earth. All the ingredients together smells SO good. It turns your shower into instant spa-vibes. The products also come in super cute packaging that even has your name and zip code (blurred out of photos for privacy). Each bottle comes with a pump, so you can use the pump in the shower and store the bottles with the cap for later use (if needed). I've used the product for over two months now and can see a definite difference. Unfortunately, I forgot to take a photo of my hair before and IG photos don't show the difference as well as I hoped. But believe me, my hair does feel smoother post-shower and it has been drying out less after my daily showers. I highly recommend giving it a try at least once. Although $25 is a little pricier than drugstore products, it is not a hefty price to pay for using clean ingredients on your head. There is enough product in the bottle to last me another (maybe) four months. Plus, if you are unhappy with how the products turned out, you can always request for another round of customization. Let me know down below if you try out Prose products. I would love to hear your opinions! I’ve been posting lots of beauty products on my Instagram in the past year, but never fully reviewed them in depth because my opinions often change from when I start using a product to when I finish. After about six months to a year, I finally finished the 11 products shown above and now I’m excited to share what I thought of each. Disclaimer: nine of the products above were received as gifts for testing purposes, but the opinions below are unbiased and my own. This cleanser is *such* a classic (along with the lotion). This is the cleanser that is recommended by dermatologists for people with sensitive skin (i.e. eczema). It is very light and does a great job getting rid of slight dirt on the face. I use it in the mornings to remove overnight oils and leftover lotion on my face and find it to be so refreshing. I would not recommend this for makeup removal because it does not give your face a deep cleanse. This quickly became my daily daytime moisturizer because of its SPF coverage. Sunscreen is so important because it both prevents skin cancer and wrinkles! This lotion has a medium thickness and smells oh so good. During the days that I was especially oily, I felt like this lotion caused me to break out slightly. Otherwise, I liked it very much and wish I had more! This body wash seriously smells so good and feels luxurious to use. I also felt extremely pampered every time I used it because it comes in a squeeze bottle similar to a facial cleanser. The consistency resembles a facial cleanser and I felt like I was getting a real deep clean every time I used it. I used the body wash with a loufa and a tiny bit of soap foamed up nicely. This lasted me a long time and I miss having such a fresh smelling body wash. I used up the Quip toothpaste, but also wanted to comment on the Quip toothbrush that is now out of batteries (so technically used up also?). The Quip toothpaste comes with directions on how much to squeeze. With a pea size, a good amount of toothpaste foams up in the mouth. It is minty and fresh. However, the toothpaste does not indicate any whitening or enamel protection and I am not sure how great it is for my teeth. I would still choose another toothpaste over the Quip one. As for the toothbrush, I rather like the subtle vibration and its rubber bristles. It does not rotate nearly as much as an electronic toothbrush and I am honestly not sure how well it works. It is aesthetically pleasing and comes with a nice holder. I have nothing against it, and will continue to use it. This brand makes its products using activated charcoal, which is all the rage these days. I received the toothbrush, toothpaste, and whitening charcoal (not pictured). The toothbrush is nice and soft and I use it as my travel toothbrush. It has black bristles to match the activated charcoal. The toothpaste is also black and it has a sweet taste to it. Again, it does not indicate any teeth enamel protection and I was not convinced it was better than the standard toothpaste brands (Crest, Sensodyne, etc.). As for the whitening paste, it honestly scared me. The minute you put it on, your entire teeth turns black. It is rather hard to wash off and the charcoal gets stuck between my teeth. I did not see a sudden improvement of whitening and I did not use it enough to report back on how well it works. I still prefer the unnatural way of whitening – Crest whitening strips (not sponsored). Overall, it was very fun to try but not sure if I would purchase. I didn’t realize I had a “dirty” scalp until I went into Aveda for a scalp check-up. They used a camera that zoomed deep into my scalp and printed some photos. Based on the images, I had hair product residue stuck on my scalp and spotty dandruff covering it. Luckily, this hair treatment deep cleanses the scalp. You put it on your scalp before shampooing and scrub your scalp gently. I didn’t check my scalp after using it (I need to go soon), but I did feel like, regardless of whether or not it worked, that it made me pay more attention to my hair washing technique. It became a habit to massage my scalp every time I washed my hair and I do feel like there was less oil at the roots and I could go an extra day without washing my hair. The in-shower treatment also came with a post-shower treatment. I used it together (again not sure how well it actually works). I already wrote a blog post about this product a year ago (read here), but wanted to update my opinion about this product after using it completely. I feel like the Moroccanoil line works best when you use it along with the other products (i.e. shampoo, conditioner, etc.). Towards the second half of the bottle when I swapped my shampoo and conditioner for non-Moroccanoil products, I did not feel like the oil improved the softness of my hair. It kept my hair moisturized, but a little stiff. This face masks really gives you a deep clean! This is one of those – leave on for ten mins and wash off masks. The minute I put this mask on my face, I feel a sharp tingliness in my “problem” areas. The tingliness does hurt at times and it is the only reason for docking off a star) It is also used with all natural material and I felt safe using it. The mask also contains little grain pieces that exfoliate your skin. I loved using this after I came home from traveling because it does such a deep cleanse of your face. I wish I had more of this product! This toner is on the pricier side, but I had the chance to try out the sample version (which honestly lasted me a good few months). Not sure if this was the intended use – but it did such a good job removing remaining makeup after my initial cleanse. Every time I used a cotton pad with toner on it, my cotton pad would come back tan from the foundation. When I tried using a cotton pad the second time (I tried both the toner and other makeup removers), it returned almost white. This is definitely a luxurious product with a steep price tag, but I definitely enjoyed using it and wish I had more. I first heard about the Ole Hendrickson Oil/Truth Serum Duo when SongOfStyle’s Aimee Song was raving about them on her YouTube channel. When I had the opportunity to try them out, I knew I had to jump on the boat. I loved the products together, but not so much separately. When used together, I felt like I woke up in the morning with fresh skin. I also used it on my boyfriend’s skin (which has spots of eczema) and he did not have any reactions. Rather, his skin looked almost normal in the morning. However, the oil can be very thick when used separately and does not combine well with other products. Likewise, I do not see the Truth Serum results as nicely in the morning when I combine it with other lotions. Overall, I would recommend it even though it is on the pricier side. I hope you found this review helpful! I had a lot of fun writing it. There are still a lot more products I am trying out at the moment so expect another empties post in about six months. Comment down below if there are any products you want me to try and write about! I was in Kauai for 5 days and 4 nights and wanted to share what I did, ate, and where I stayed to hopefully help you plan your trip. For the first two nights, I stayed at the Grand Hyatt Resort (click for an in-depth review). It is the perfect place to sit back and relax because its located right next to the beach and there are tons of food and drink options. For the next two nights, I ended up camping in Anini and Haena Beach. I HIGHLY recommend camping in Kauai! The campground is pretty much anywhere with grass near the beach. At both beaches, I camped pretty much right next to the water and fell asleep to the waves crashing. In the morning, I watched the sunrise with rainbows appearing in the sky. It was one of the most magical experiences I have had. HOWEVER, there are a LOT of roosters on this island and they are very loud. At Anini beach, roosters were crowing at 11pm, 2am, 4am, and 6am. Do bring ear plugs. You also need a permit to camp at these beaches. They are roughly $3 a night per person (so cheap!) and you can buy one by mailing in a cashier check. You can also get it the day of, but I have heard that the beaches get full pretty fast. At Haena beach, there is also a cave across the street that is fun to explore. Haena beach is also very close to the famous Kalalau Trail, so it is convenient to camp within close proximity to the hike to avoid the morning rush. If you are renting a car, I recommend listening to the Shaka Guide for fun historical stories at each of the main tourist attractions in Kauai (#notsponsored). There are so many great snorkelling places on this island. During the winter, snorkelling occurs on the South Side of the island due to the extra high currents on the North Shore. In the summer (you guessed it), snorkelling happens on the North Shore. I snorkelled in Poipu Beach, right next to the Grand Hyatt, and there was a convenient shop right next to the beach to rent gear (for only $8). You can also buy fish food, but the fish get aggressive when they're fed. Just by walking in and dipping my head in, I already saw so many different coloured fishes. It was incredible. I would say Kauai is probably one of the Hawaiian islands with the most hikes. First, the West side of the island has Waimea Canyon and Koke'e State Park. The most popular hike in the Waimea Canyon is the Canyon Trail, which is roughly a 2.9 mile trail. If you are going during December, the paths are extremely muddy, but worth it. Don't forget to grab one of the sticks at the entrance of the trail. It will help a lot. On the East side, there are many hiking trails by Wailua and Opaeka'a Falls. I personally opted out because I was there during my last day, but I saw people swimming in the falls below and it looked fantastic. On the North side, we have the famous Kalalau Trail. This 11-mile one-way trail is one of the hardest trails in the world because of one cliff edge where people literally crawl to get across. At the very end, you reach a remote beach that can be only accessed by the trail. It is also the only trail along the famous Na Pali coastline, which is something so beautiful that most cameras can't capture it. You must see it in person. But, don't fret if you're not ready for the 22-mile round trip hike. The first 2 miles actually takes you to the remote Hanakapiai Beach. In December, the trail was extremely muddy, so make sure you add an extra 30 or more minutes to your estimated time because its hard to walk fast on this trail. There is also a stream you have to cross. Do read up on the warnings of this trail because the stream has killed people before when there flash floods. Beyond Hanakapiai Beach, you can hike another 2 miles to reach the beautiful 120 feet tall Hanakapiai Falls. You must see the Na Pali Coast from either boat or helicopter. It is the prettiest part of the island for sure. I opted for the helicopter tour and took a helicopter with no doors. I don't recommend this if you do not like wind. Otherwise, this is definitely worth it even if you get airsick. The views were absolutely stunning and the helicopter gets really close to the canyon walls. You get to see Waimea Canyon, most of the waterfalls, Hanalei Bay, and Na Pali Coast. The pilot also tells you where all the movies were filmed. On the other side of the North Shore, there was the Kilauea Lighthouse. It is a $5 entrance fee to get in, but there is also a lookout point before the gate. You can see so many different types of birds flying around and nesting. You can also spot a Nene, which is the endangered Hawaiian goose. Be careful, they can be mean if you get in their way. In Koke'e State Park, there are many lookout points as well if you are not interested in hiking. Each of the points gives you a view of the canyon or part of the Na Pali Coast (and of course many rainbows!). In the East Side, all the waterfalls have a lookout point and there are many stop points to see Heiaus. Just relax on a beach! There are seriously so many beaches on every side of the island. In the East, there is Polihale. In the South, there is the Shipwreck Beach in front of the Grand Hyatt and Poipu for snorkelling. In the North, there were many including Anini, Haena, Tunnels, Ke'e, Secret Beach, and more! My personal favourite was Moloa'a because there was no one there. Although I did not personally do this, I saw many people kayaking and stand-up paddle boating in the Wailua River. It looked very fun. If you have done it, leave a comment down below and share with us your experience! Loco Moco is my all time favorite Hawaiian dish. It features rice, beef, egg, and a thick sauce. It is so filling and will fuel you up after a long day of hiking. Mark's Place had amazing Beef Stew and Loco Moco. When spam was introduced to Hawaii during WWII, it became incorporated into Hawaiian dishes and became a staple. Spam masubi can be found pretty much anywhere. I found them in local grocery stores and also at the other restaurants that I mentioned. Kalua Pork from Smiley's Local Grinds was hands down one of the best things I ate on the island. The pork was so flavorful and it was wrapped up in seaweed that just fit perfectly. Together with rice, I was so full and happy. They also have amazing oxtail soup. With the warm weather, shaved ice in Kauai will make you instantaneously happy. They have many fun tropical flavors, such as lilikoi and coconut. I went to JoJo's and boy were the servings huge. Haupia is a Hawaiian traditional coconut dessert. It tastes like a mushier, more solid jello and is definitely a fun treat. I found Haupia at the Koloa Fish Market and Village Snack Shop & Bakery. Poke on the island is nice and simple, no extra ten toppings you can add like the stores here in Cali. Instead, the poke is each flavored differently and you pick and choose. On the south side, Koloa Fish Market was bomb. My favorite was the Kimchi poke. On the East Side, Pono Market had nice fresh poke and other seafood options, such as octopus. I was told that Ishihara Market is the best on the island, but I didn't have a chance to try since it was on the West side. Island weather also means amazing tropical fruits. The avocados here are HUGE and the papayas were insanely sweet. Of course, you also have to get a coconut. Moloa'a's Sunrise Juice Bar had amazing tropical smoothies and lots of fruits to choose from. Highly recommend. It is also located across the King Kong Mountain so you have a nice view while eating. The taro on the island is also supposed to be very good, but I did not have a chance to try. Of course, every place needs some good breakfast places. My personal favorite was the Kilauea Bakery & Pau Hana Pizza. There were SO many options to choose from. I was there at 9:10 am (the place opens at 9am) and everything was already selling out. I got a breakfast strombolini, sweet bun, fruit bread (honestly can not tell you what was inside, but it was so good), guava macarons, lilikoi cream puffs, coffee, and fresh OJ. I pretty much stuffed it all down my throat because everything was so good. Another good breakfast option is the Village Snack Shop & Bakery for their fun tropical pancakes (coconut, lilikoi, and macademia nuts). As an island, they have great seafood dishes aside from poke! I ate at the Tidepools in the Grand Hyatt and have a review of the food in this blog post. I packed three dresses and a whole bunch of workout clothes and bikinis because Kauai is all about the hikes and beaches! For the resort life, I highly recommend a cute maxi dress that can blow in the wind because it makes you feel like an island princess (and who doesn't like that?) and a formal dress for fancy dinners. The two dresses I wore is from ShopSugarSands and I absolutely love them (click on the link to shop Dress #1 and Dress #2). I also brought a shorter dress to use as a cover-up that won't drag in the sand when I went on the beach. For athletic clothes, I recommend long pants if you're going in December because the paths are very muddy. It is rainy, so I also recommend bringing a light rain jacket, waterproof hiking shoes, and waterproof socks. I hope all of this was very helpful and would love to hear what you did in Kauai (if you did go) or what you are planning on doing (if you have not) down below! Hello and welcome to wonderlostxx! In the past, I have written many outfit posts, where I solely talk about outfit details. However, I want to take my posts to the next level and merge my outfit posts with motivational tips to help YOU succeed. I've read/watched/tried MANY self-help motivational tactics and I want to tell you what I have learned over the years. Today's post is about how to stay motivated. I am a creator for both my job and my blog. Therefore, I have to be my own boss and I have to drive my own projects. The hardest part about this is finding the motivation to keep going when projects fail and no one is telling you to keep trying. This post includes five tips that I follow when I need to stay motivated along with some outfits to help you keep grinding. I know bullet journals have been taking over the internet, but I swear they work so well! You don't have to create beautiful pages and deck out your journal (although please do if you want!). I am personally not an artist and can't make my pages look as good. But, I use my journal to keep track of my monthly, weekly, and daily goals, blog posts, projects, etc. The big difference between my bullet journal and many others is that I write my to-dos for the next day at NIGHT. That way, I know exactly what I need to do in the morning and I can get right to it when I wake up. This prevents me from wasting 30 mins during my peak productivity hours figuring out what to do that day. A specific post for bullet journaling will be coming soon. How you feel about yourself plays a huge role in how motivated you will be. If you're feeling confident, it will surely reflect in your work. One way to achieve this is to always get dressed even if you are working at home or just holing up in the library all day. Here are two outfits that are perfect for both working and looking like a confident boss lady. Exercising is so important for keeping your mind fresh and charged. Every time you work out, your brain releases stimulants that improves your mood. These help you stay happier, relaxed, and even increases your energy levels! I find that exercising is the perfect way to de-stress and to muse over work-related issues without any distraction. It is also the perfect opportunity to listen to lively music that may have been distracting for work. (Workout playlist and my workout routine in future post). Most motivational websites advise to work out in the mornings, but I personally believe you should work out at the hour that works best for you. I like working out at night because it is my time to pump out the stress and I don't feel the need to go back to work because I already finished my workday. No matter what your schedule is, it is important to work out multiple times a week at a set schedule! Working out once a week will not give you the desired effects. Along side maintaining consistency in your workout routine, having a set and stone daily schedule is just as important. When you have a schedule that works for you, you will spend less time worrying about how the day is going to go and you can just focus on getting your work done. Don't forget to schedule in some down-time as well. Your mind and body need a break to achieve maximum productivity. Again, a post on scheduling will be out soon. Cliché - I know. But I'm serious. Set some time everyday to gain inspiration in the form of in-person communication and through online (or paper) resources. Find people that you can grab coffee with to talk about your work. The best ideas come after being able to bounce them off somebody. You will be able to notice more when you speak verbally about it and gain insight on your project. Also, set aside time everyday to look for inspiration online - whether it be in the form of Pinterest boards, reading articles, newsletters, etc. Whatever it may be that suits your field the best. Do it. Most importantly, set aside some time afterwords to PROCESS the new information. Mindless browsing is equivalent to not browsing at all. If you like these types of posts, please let me know down below in the comments! I hope these tips can help you stay motivated in your everyday life. I still remember when Moroccanoil first came out - I wanted to get my hands on all the products so badly. So when I had the opportunity to review their Hydration Collection, I was extremely excited! 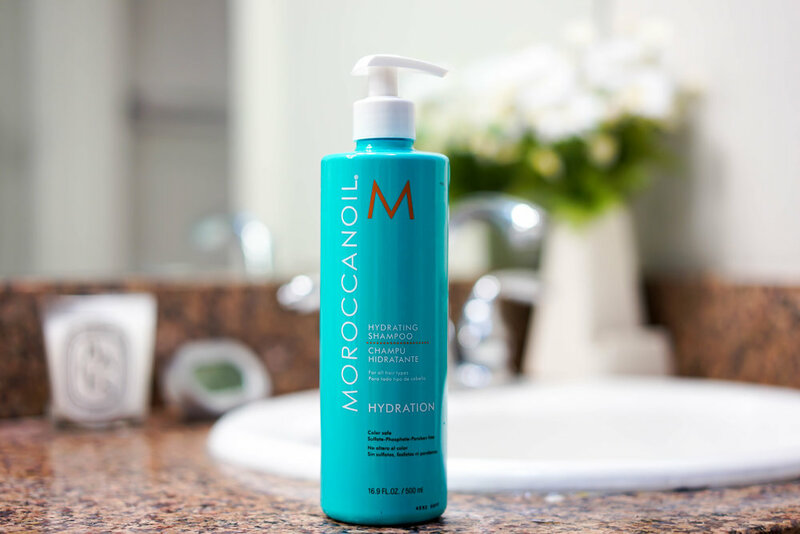 I have used a fair share of hair products in my life ranging from home-made avocado hair remedies to deluxe break-the-bank hair products and I honestly have to say I absolutely love the Moroccanoil products. All of the products include Argan Oil , which comes from the nuts of Argan trees and is quite rare. It contains high contents of antioxidants, fatty acids, Vitamin E to help restore dull hair. Our bodies need vitamins, and so does our hair. My hair is pretty damaged thanks to all the hair color treatment it's been through. Therefore, I try really hard not to wash my hair everyday but there's always that struggle between not washing and trying to avoid oily flat hair. I tried out the Moroccanoil Dry Shampoo Dark Tones on a three-day hair and my hair really did look like I just washed it. I had to reapply after six hours of walking around. This dry shampoo was also made especially for dark tone hair like mine, so I don't see the gross white residue that must dry shampoos leave. And to all the ladies with lighter hair color, no worries there is a Dry Shampoo Light Tones for you too. It's kind of hard for me to measure just how great a shampoo really is, so what I will comment about the Moroccanoil Hydration Shampoo is that my hair definitely feels clean. Clean in the form of being very lightweight and I didn't see oil in my hair until the end of day two. Usually, I start seeing it after day one. I used it with the conditioner so I can't say the shampoo independently does this, but the set works wonderfully well. Also, a little goes a really long way with this shampoo. It does not lather up into many soap bubbles like some shampoo but I felt like I could easily run a pump of it through my hair (a little past shoulder length). I would say the exact same for the Moroccanoil Hydration Conditioner. My hair felt very clean and lightweight, which lasted a good two days. I used it once without any hair leave-in products afterwards and my hair didn't feel dry and bristley afterwards. It wasn't so incredibly soft that I felt like my life changed, rather it was smooth enough where I didn't wake up with a million knots in my hair and it felt like my hair had retained some of the water (in a good way). Of course, I now have to try the very famous Moroccanoil Treatment. I tried this product both on a day where I used the Moroccanoil Hydration Shampoo/Conditioner set and one day on just a 2-in-1 shampoo wash. I will admit my hair was a lot smoother after using the Moroccanoil Hydration Shampoo/Conditioner set, but both times I could feel an instant increase in softness in my hair. My hair is rather thick and stiff, and after putting on the a pump of the oil I could feel my hair relax. It also shined and looked healthy for once. This effect disappears within a day, so I would recommend using it every night. This is also a great product to use after styling hair. I've been using it during my photoshoot days. For my photoshoots, I have also been testing out the Moroccanoil Hydrating Styling Cream. I usually mix hairspray with wave texturizing spray, so that is what I am comparing this to. In addition, my hair has a tendency to not hold curls given the new curling iron I am using. I curled my hair with an one-inch curling iron rather tightly and gently spread the styling cream through the curls around 9:00 AM. After a few hours of driving and running around for photos, my hair still held its curls around 11:30 AM. By 3:00 PM, my hair became loose waves. Overall, this held way better than my previous method. My hair didn't completely hold the curls, but the general shape was still there. Also, another great aspect of this product was that the cream doesn't make my hair look crispy. The waves looked extremely natural and amazing for all my photos. Now, saving the best for last... the Moroccanoil Intense Hydrating Mask. Ok I have to say this is by far my FAVORITE product in the whole line. At first I was a little skeptical because I've used a lot of leave-in conditioner, hair mask-type products and my hair is never as soft as they claim it should be. I tried out this mask after using the Moroccanoil shampoo/conditioner and left a good amount in my hair for five minutes when I was in the shower. When my hair dried, it was SO incredibly soft. It felt like I just came out of a deep conditioning treatment from a fancy salon, but for one tenth of the price! This softness lasted a few days until my next shower and I honestly can't wait to use more of it. (The softness didn't completely disappear, it just wasn't AS soft as it was when I first used it.) I HIGHLY recommend this product especially for all you ladies who color treat your hair! I had so much fun swishing it around because it was so soft and flowy. Overall, I really loved all of the products and believe I finally found a set of hair products that can return my hair back to its original pre-colored state. Let me know if you have any questions down below or if you have any additional thoughts on the products as well! You have probably seen Daniel Wellington watches before. If you haven't, quickly go on Instagram and you will see it. I'm so happy to add Daniel Wellington to my watch collection and I can't wait to wear it on Valentine's Day. I chose the Classic Black 36 MM Sheffield in Rose Gold watch (linked below) because I loved just how black it was! It matches perfectly with my usual black ensemble as well as my Valentine's Look (check out my previous blog post for details). I can't wait to wear it next week on my date. Wearing this watch gives me instant confidence because I feel so chic and classy. Just what I need for my Valentines. Since I know that many people absolutely adore these watches, this is the perfect Valentine's Day gift! The leather is extremely high quality and the watch fits perfectly on my wrist. I have small wrists usually watches are too big for me, but the smallest size of the DW watch fits me perfectly. The watch face and straps are also interchangeable, so if you get bored you can just switch up the look. I personally also love the classic white watch face with the brown straps. Scroll to the bottom to see all the different options. The watch also comes with a beautiful box and bag, so you don't even have to wrap the present. I'm personally pretty awful at wrapping gifts, so the cute bag is a life savior for me! If you order now, Daniel Wellington is gifting a beautiful heart charm along with your order. Now wouldn't that be a surprise for your date ;). Also, since I know shopping can get expensive, you can use the code "WONDERLOST" for 15% off your purchase! You're welcome. If you get the watch or have the watch, please tag #wonderlostDW on Instagram, so that both Daniel Wellington and I can see how you style it! I'll be featuring my favorite shots on my Instagram story.